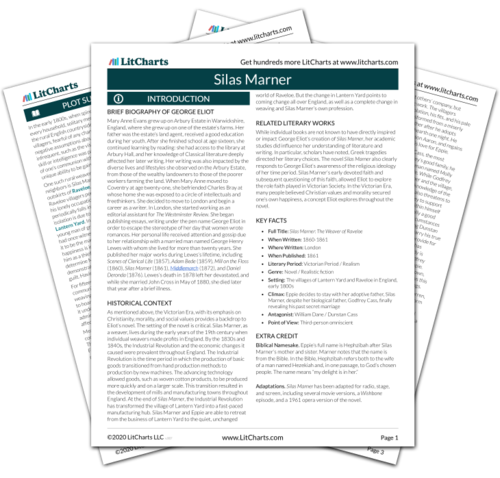 Instant downloads of all 942 LitChart PDFs (including Silas Marner). 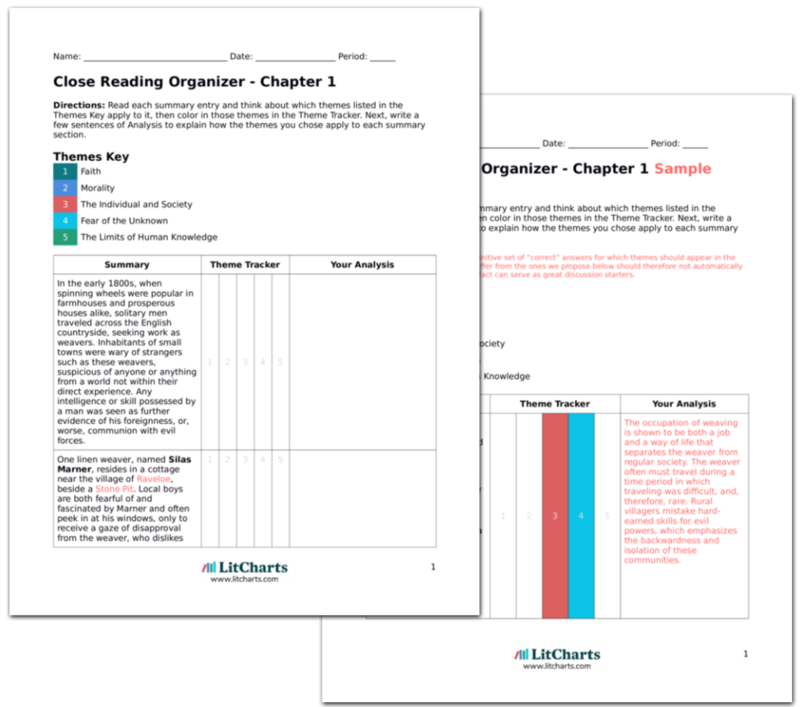 LitCharts assigns a color and icon to each theme in Silas Marner, which you can use to track the themes throughout the work. From a distance, Godfrey watches Eppie grow up in Silas Marner’s care. Occasionally he does what he can to help the weaver, but he does not want to do too much and raise suspicion. Godfrey seems determined and firm. Dunstan has not returned and Godfrey no longer feels the threat of his brother’s presence. Everyone, including himself, thinks he has reformed and set his feet on a better course. He rides to visit Nancy nearly every day and feels the imminence of his own happiness with Nancy, and their future children. He promises himself, however, that when the opportunity presents itself, he will see that Eppie is well provided for. Godfrey has transformed in spirit and in behavior. Freed from his secret and Dunstan’s presence, he becomes both devoted to Nancy and confident. He consoles himself about Eppie by promising that the time will come when he’ll be able to do more for her. However, now that this secret no longer threatens him, Godfrey feels no guilt about having kept the secret: it is not his conscience that has bothered him throughout the book, but a rather selfish concern for his own future. Champlin, Nikola. "Silas Marner Chapter 15." LitCharts. LitCharts LLC, 3 Mar 2014. Web. 22 Apr 2019. Champlin, Nikola. "Silas Marner Chapter 15." LitCharts LLC, March 3, 2014. Retrieved April 22, 2019. https://www.litcharts.com/lit/silas-marner/chapter-15.